Thank you for waking me up with the sunshine streaming through my curtains this morning. If that's something that could be arranged for every morning that would be delightful.You're still chilly but I don't mind and it doesn't even have to be be sunny all day, even if it's just a few hours in the morning I'd still appreciate that. You're a short month but I have big hopes for you. January was filled with plans and that was wonderful, but your days this month will be filled with doing things. Things I never even thought possible a few weeks ago. I'm excited about these brand new possibilities and it's time to work hard to turn them from dreams into something real. 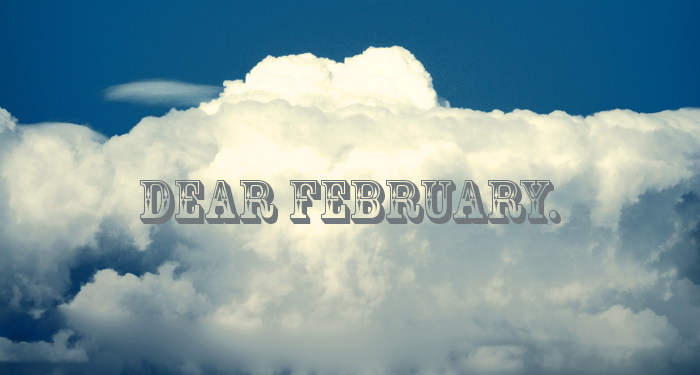 What a lovely way to welcome February. Good luck with your dreams! This is a lovely post :) A great idea to do at the start of every month..
Aw lovely post Jennie - as always! Heh, I totally still say Feb-roo-ary in my head whenever I have to write it down! So lovely. I have similar problems with practice/practise. Wonderful words to start the month off Jennie! February has been a tad too rainy for my liking, but still it contains half-term so I can't complain too much!